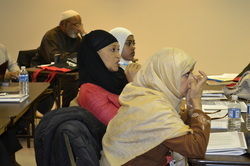 November 11, 2013-More than 70 national leaders and speakers came together to participate at the 1st Annual ISNA Masjid Forum in Plainfield, Indiana. The forum was held from November 8 – 10, 2013. 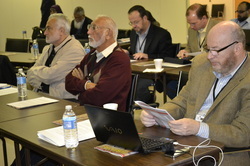 At this conference the board members, mosque leaders, and Imams presented papers and discussed various topics on Masjid Development in areas of Governance, Women leadership, Youth Leadership, and more. The program committee was led by Dr. Ihsan Bagby, an associate Professor of Islamic Studies at the University of Kentucky. Among the focal points of the conference was the presentation of “Masjid Needs Assessment Report – 2013”. This study was conducted by Dr. Bagby to determine strengths, weaknesses, priorities, and needs of Masjids across America. This forum is the first step toward making Masjid development among one of the top priorities of the Islamic Society of North America (ISNA). The conference kicked off with a welcome from the ISNA Secretary General, Dr. Iqbal Unus and the conference program chair, Dr. Ihsan Bagby. In his welcome remarks, Dr. Unus pointed out the importance of this forum and its goals. Dr. Bagby reminded the participants of the need in taking practical and concrete steps towards Masjid Development. This was followed by a session on the “Prophetic Masjid” led by Farooq Malik, Sarah Sayeed, and Abdur Rahman Khan. The discussants of the session included Tayyibah Taylor and Haris Ahmad. During the session the panelists focused on the fact that a Masjid is not just a place to pray but also a community center and therefore should address comprehensive needs of the community. Other sessions included topics on Setting the agenda for Masjid Development, Youth involvement in Masjids, Women friendly Masjid, Masjid Governance, and the recommendations for Masjid Development. As a leading national organization, ISNA is committed to the cause of Masjid Development in America and will provide resources and platforms for discussions and development in this area.